Since freezing can cause cellular damage, the frozen meat is expected to loose more mass due to fluid loss. If, and how, freezing affects the flavor or texture of the meat is unknown. Recipe adapted from Alton Brown’s pan seared rib-eye found in Good Eats: The Early Years (page 14). However, we eliminated the 5 minutes over high heat, and add the steaks immediately when the the pan is placed over hight heat. Take surface temperature and mass both steaks (frozen and fresh). Place frozen steak into a zip top bag and thaw in a water bath (approximately 1 hour 45 minutes). Measure surface temperature and mass both steaks (thawed and fresh). Measure surface temperature and mass both steaks. Cook each steak according to Alton Brown’s recipe, recording surface temperature before each flip. Measure surface temperature and mass both steaks, this would also be a good time to measure the internal temperature using an instant read thermometer. Sample both steaks, making note of colour, flavor, and texture. Enjoy a slice of pie for dessert, if available. Note: Since the expectation involves mass loss, we refrained from measuring internal temperatures using an instant read thermometer, as doing so could have allowed more mass carrying juices to escape. Before the steaks were cooked, a series of photos where taken after eat stage of preparation. 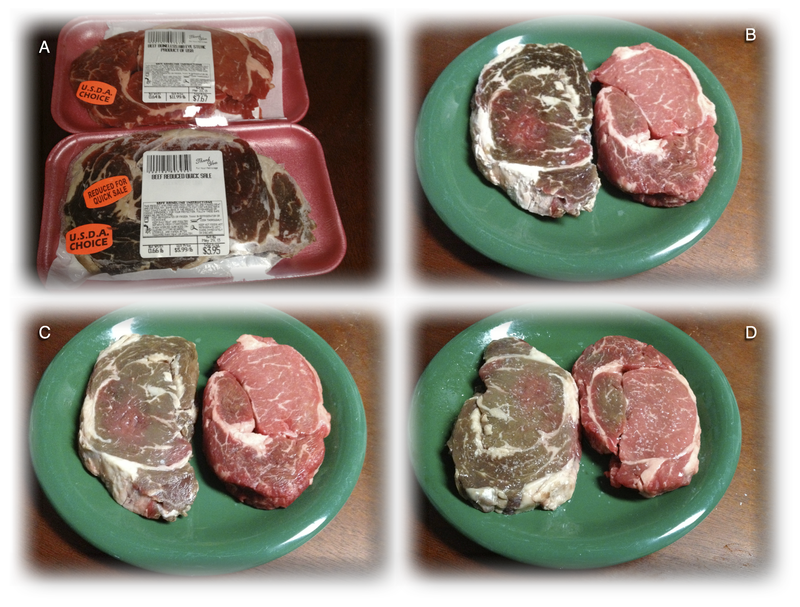 The first photo (A) was taken before the steaks were removed from their packaging, which shows the cost of each steak. The price per pound was $11.99/lb for the fresh steak and $5.66/lb for the frozen steak. The next photo (B) show the steaks right after they came out of their packaging. The frozen steak (left) has a dark brown colour where the fresh steak has an appealing redish colour (probably due to carbon monoxide treatment). After thawing (C) the brown colour of the previously frozen steak has lightened slightly, but is still very brown. The final photo (D) shows the steaks coated in canola oil and salted, we opted to omit the pepper called for in the recipe. Raw steaks before cooking. A) in packaging, B) before thawing, C) after thawing, D) seasoned. During the preparation and resting process, masses of each steak were recorded. However due to the high heat and time constraints in the cooking process, masses were not taken during the cooking process. Below is a table that records the masses of each steak at each phase (note: due to what we assume is a transcription error, the pre/post rest masses were recorded as 156.1, 144.4, and 146. Since these are crazy low numbers, we have assumed that they should be 256.1, 244.4 and 246). Mass of each steak at all measurable points in the cooking process. 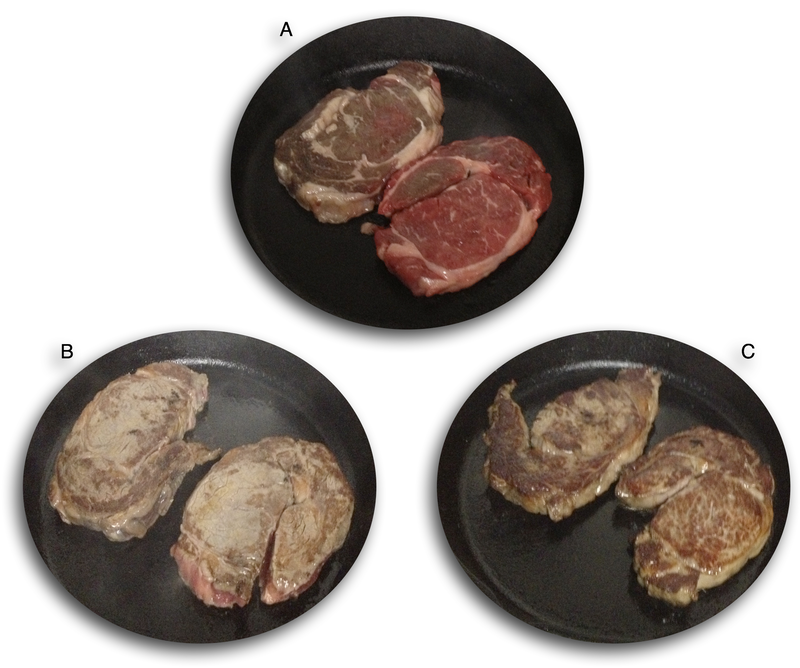 Below is an image consisting of three photos showing the steaks at different points in the cooking process. The first (A) is 30 seconds after the steaks were placed into the skillet. 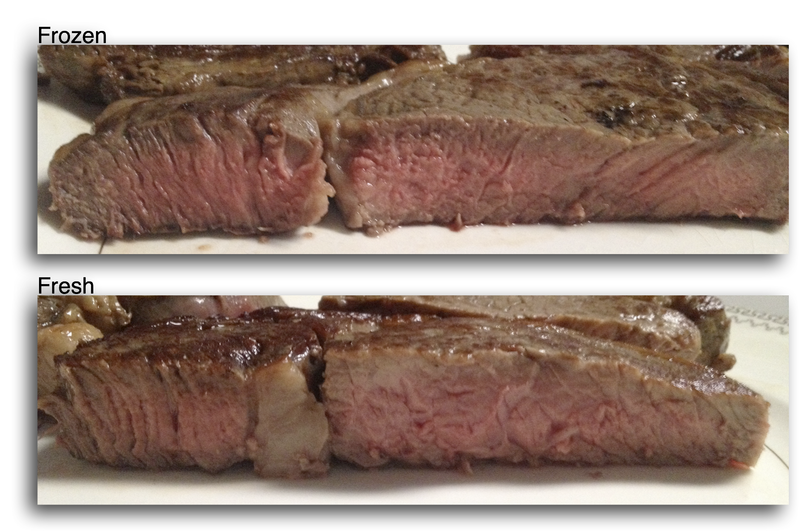 The second image (B) is 30s after the first flip, an right before the steaks went into the oven for 2 minutes. The final image (C) was taken after the steaks came out of the oven and were ready for resting. No image was taken before the flip while the steaks were in the oven. Through the progression of photos, the effects of the maillard reaction turning the steaks progressively browner is evident. Steaks during the cooking process: A) right before first flip (30s), B) right before going into the oven (60s), C) right before removal from skillet. 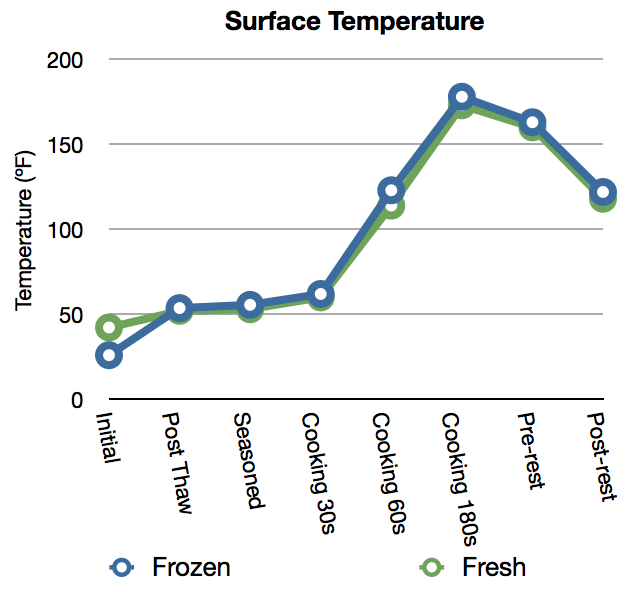 Surface temperature at each phase of cooking. Cross sections of both steaks after cooking, frozen (top), fresh (bottom). In terms of flavor and texture, the steaks were mostly indistinguishable. The frozen steak did have a slightly better flavor, but was determined to have a sightly drier texture. 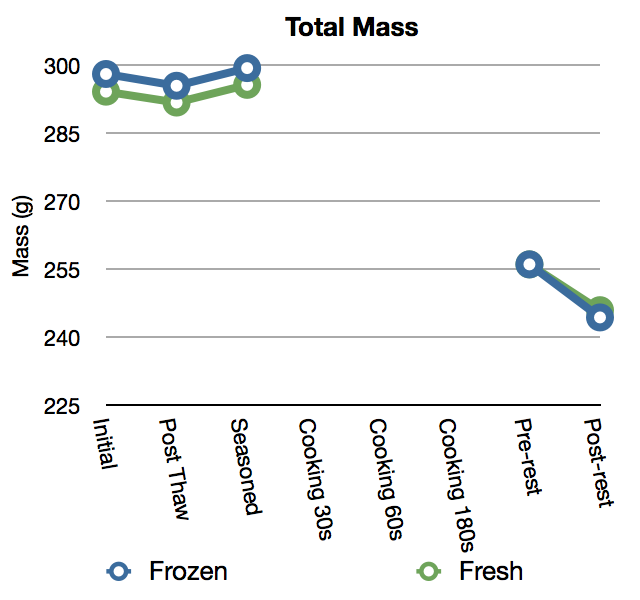 As the following graph shows, the overall mass loss as a percentage of initial mass was indeed greater for the frozen steak. However, the qualitative analysis indicates that this is not sufficient to rule that the fresh steak was superior, as the frozen steak was found to have better flavor overall. 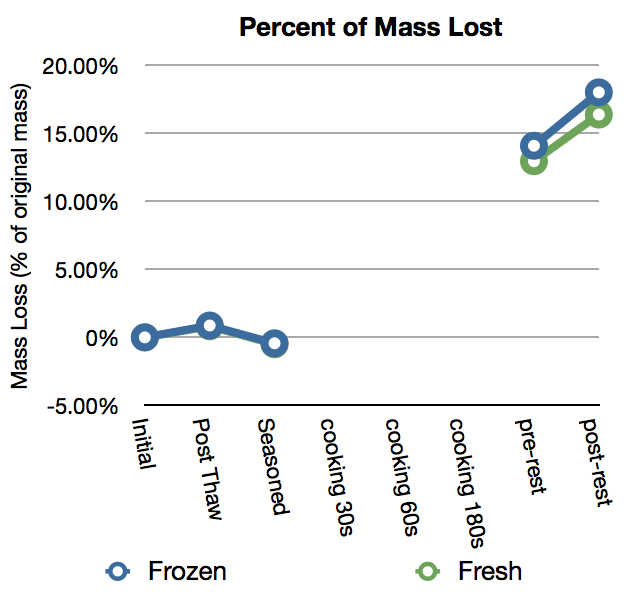 Percentage of initial mass lost for each steak. The most surprising result was that the frozen steak had a better flavor (particularly the fatty bits). Slightly less surprising, as these steaks were not purchased at out normal steak dealer, was that both steaks seemed tougher than we expect rib-eyes to be, and overall the quality of both were considered to be mediocre. An informal blind taste test (n=1) given to my co-blogger indicated that the frozen steak was a bit drier than the fresh one. Given the huge (50%) price difference between the frozen beef and the fresh beef, along with the almost indistinguishable taste and texture of the meat, the obvious conclusion is that the frozen meat is the better choice. That being said, both steaks were on the low end, quality-wise, for rib-eyes. Neither steak was as good as a rib-eye should be. It is possible that starting with higher quality steaks, the difference may be more interesting. It’s also possible that the extra aging that the frozen steak was subjected to prior to being frozen helped enhance its beefy flavor, thereby leveling the playing field. The purpose of this study was to find out if there is any significant difference between frozen steaks and fresh steaks, since frozen tend to be much cheaper (half the price in this case). This required us to buy a frozen and a fresh steak, which meant the steaks were probably from different cows, and any difference we noticed may have been due to this uncontrolled variable. In future studies we hope to control for this variable by purchasing two fresh steaks and freezing one to test the viability of stocking up when steaks are on sale and freezing them for later consumption. why would you add seasoning…. the whole point of the experiment is to test the arbitrary taste experience of the two steaks. Adding flavor does not seem to help. Our main goal was to determine if fresh vs frozen matters when steaks are prepared the way me normally prepare them. The oil and salt also apparently serve important roles in terms of heat transfer and crust formation, however we’ve yet to test any of those claims.